The Mobility Cycle has two front drive wheels propelled by hand cranks. The rear wheel steering is accomplished by pivoting the seat and is modulated by actuator springs. 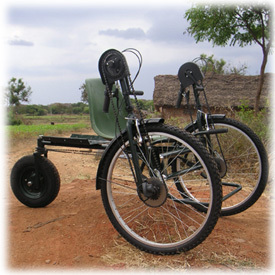 The absence of front wheel steering eliminates the high risk of accidents and injuries from tipping over that are associated with nearly every tricycle wheelchair design that is used in developing countries. Each wheel hub includes three forward gears and one reverse gear. These can be operated independently or in unison. The Mobility Cycle is adjustable along all three axes (x,y,z) to enable optimal positioning for the rider in relation to seating, propulsion and steering. It is constructed of readily available and easily repairable bicycle components, and includes a tubular frame of 4130 chrome molly steel. An early prototype of the mobility cycle has been used for two years by a 17 year old girl who has 3 limbs disabled by polio. She is able to propel and brake using only her right arm. A young boy with four limbs severely affected by rickets also uses the cycle in an isolated village setting. The low gearing, 24 inch front wheels and seat-activated steering make this possible. Neither of these children would be able to use a conventional push rim or tricycle wheelchair design. 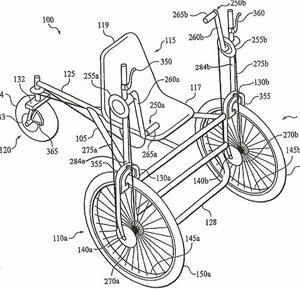 Multiple worldwide patents insure that high levels of quality and important safety features are maintained for mobility cycles produced in all regions of the world.